On 12/29/15 at approximately 8:00am The Livingston County Sheriff’s Police responded to a report of a vehicle submerged in a creek at the intersection of 3300E @ 3100N Rd, Dwight, IL. The driver is unaccounted for. Dwight Fire, Livingston County Sheriff’s Police, along with other agencies and volunteers, will be continuing a ground search in the area today. Water Rescue teams have determined the water is unsafe to enter due to conditions. We urge everyone to not enter any bodies of water at this time. This investigation continues and additional details will be released when available. On 12/29/15 at approximately 8:00am The Livingston County Sheriff’s Police responded to a report of a vehicle submerged in a creek at the intersection of 3300E @ 3100N Rd, Dwight, IL. Area Water rescue units and Fire and Rescue departments were called to the scene and removed a Blue 2011 Hyundai Sonata from the creek. No occupants were found in the vehicle. An extensive search of the area was conducted by Illinois State Police Air Operations, Dwight Fire, and Campus Fire Dept. The results of the search yielded no occupants of the vehicle being found. I am here today with a very heavy heart after sleepless nights of trying to decide what the best course of action is in regards to this unfortunate situation we find ourselves in. I am here today to defend the Livingston County Sheriff’s Department and all of these wonderful servants of the people, standing here behind me, as well as those who couldn’t be here. These folks are here, in uniform, on their free time, not getting paid, but to show their loyalty and support for the citizens of Livingston County. The recent article in the Daily Leader wherein Livingston County Board Member John Yoder aired several grievances he has with the Sheriff’s Department demands a response at this time. We in the Sheriff’s Department have tried to cooperate and work with Mr. Yoder on numerous occasions over the past several months, but he has put up roadblocks at every turn. A good example of this is the $85.00 used for the purchase of children’s candy for the Thresherman’s parade that was brought up at the September 8, 2015 Committee meeting. It has long been the practice of the Sheriff’s Department to develop and maintain strong relationships with the citizens we serve, especially the children. Part of developing those relationships includes participating in parades, passing out candy to the children, appearing in the schools and other community events. It is ever so shameful that Mr. Yoder brought the matter up in the fashion he did. 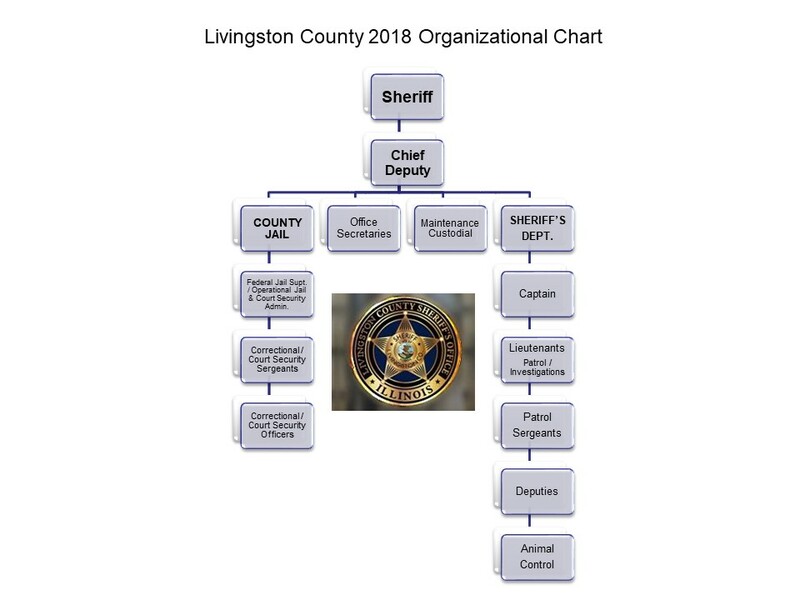 To be clear, I was elected by the People of Livingston County to run the Sheriff’s Department and to be their Public Safety expert. I answer to the People of Livingston County, not to certain few members of the Livingston County Board. I stand by the decisions I have made and the great people working in the Sheriff’s Department. The suggestion by Mr. Yoder and board member Mike Ingles that someone from my department walked in uniform for a political candidate is absolutely false and completely unsupported by any facts. While neither can identify who made the accusation or what officer was allegedly observed. I, nor did my Chief Deputy appreciate being verbally attacked about this at that meeting. I was at the Thresherman’s parade. I was in uniform along with Deputy Sam Fitzpatrick and Canine Officer Zico. The three of us rode in the canine vehicle while representing the Livingston County Sheriff’s Department, which has been common practice for over the last 25 plus years. If there had been any other Deputy wearing a uniform and marching in that parade I would have seen them. The face that an overwhelming majority of Law Enforcement in this county supports one candidate over another, running for State’s Attorney is not improper. My Deputies are free to choose who they will and will not support. Any allegation that they were in uniform is absolutely false. I can assure you that NO ONE FROM MY DEPARTMENT ENGAGED IN ANY MISCONDUCT. Furthermore, what my deputies do on their off time when they are not in uniform is their own personal business as long as it’s not illegal, or improper. As your duly elected Sheriff, it will never be my practice to infringe upon anybody’s (be it a Deputy or anyone else) first amendment rights and their freedom of speech. Nor will I be beholden to tyranny. Furthermore, do I have ties to Flanagan? You bet I have ties to Flanagan! I am a taxpayer and a homeowner in Flanagan! I have many friends in Flanagan as well as throughout Livingston County. Do I know Patricia Estes? You bet I know her and yes, she is a friend of mine and has been a friend for a very long time. However, it wouldn’t matter whether she was a friend or not. I did not sign a warrant for her ex-husband’s arrest. A judge did that! It is unfortunate that Mr. Yoder chose to speculate, those are his own words, without any foundation whatsoever. I am further disappointed that the Daily Leader chose to print such speculation with no basis at all and did not contact me for a response. The bottom line is that it is my duty as Sheriff to serve that warrant. I do not decide what warrants to serve, or not to serve. I serve all warrants. While I am not going to waste time getting into the specifics about the cost of serving warrants, I will point out that we do recover a fee for mileage and reimbursement, all of which goes directly into the general fund. Mr. Yoder complains that I had not been present at any Sheriff, Jail, and License Committee meeting between June 2, 2015 and September 8, 2015, which made it difficult to balance the budget. Neither myself, nor anyone from my department is required to attend the Sheriff, Jail, and License Committee meeting. We have always attended those meetings as a courtesy to the Board to answer and general questions they may have. If I am not personally present, there has always been a representative from my department present. Also, on the issue of the budget, even though the jail netted $ __________ from our Federal and Cook County inmate programs last year, all of which also goes straight into the Livingston County General Fund, I was informed that this year my budget would have to be cut by approximately $422,000.00. As a result of the budget cuts enacted, the Sheriff’s Department may have to lay off as many as 4 Officers in the future to meet these budget constraints. We are the 4th largest county in the State of Illinois with 1,043 square miles to patrol. My number one concern is the safety of the citizens of Livingston County. We are sometimes so short of Officers that we have to call other towns to provide back up because by the time an officer gets from Chatsworth to Streator, we could have an officer or victim in grave danger. It seemed very ironic to me that at the very moment my budget was cut by $422,000.00 causing a possible risk to public safety, a bike path was approved for a cost of $377,000.00 over three years and increased the State’s Attorneys budget by $55,000.00 giving him another Assistant State’s Attorney at a time when his caseload and outcomes of cases continues to decline. This would seem to me to be a favored endorsement of a State’s Attorney up for re-election. It’s absolutely amazing of the sum total of those two figures added together. Especially seeing how most everyone else’s budget is cup, except his. Moreover, Chairman Marty Fannin showed his disdain for Law Enforcement & Public Safety when on August 7, 2015 all of the area towns and villages that participate in police protection and coverage from the Sheriff’s Department received a letter from him that in the future if they want to continue having “police coverage” it will cost each village or town $85,000.00 per year. Where are these small villages and towns going to come up with $85,000.00? Is that not why we pay taxes; for the safety of our citizens? Chairman Fannin then proceeded to direct the Finance Committee to cut the Sheriff’s Department budget by $422,000.00. This type of tyrannical abuse of power needs to stop. Finally, I feel compelled to comment on the subject over my Public Safety Director’s stipend or raise Mr. Yoder referred to. I will say that there is one thing that he was right about; the raise was granted before I became Sheriff and then was placed into my budget where it still sits today, only never to be paid to me. I would simply point out that according to a trusted legal advisor, the controlling statute and case law does not prohibit the Finance Committee, or the Board from honoring their commitment that they made to me. Last, but not least I feel that due to Mr. Yoder’s very unethical action of spreading speculation and innuendos about a private citizen, who did nothing to deserve that kind of treatment, along with falsehoods about Livingston County Sheriff’s Deputies, should tender his resignation immediately. To my knowledge, never before has a previous Sheriff, or private citizen been treated with such malicious disrespect by a Board member and I have to wonder why. In conclusion, I ask that the citizens of Livingston County to continue having faith in me and to continue supporting me, the Sheriff’s Department, and all these wonderful men and women and their families who make daily sacrifices, whole placing their lives on the line to keep the citizens of this county safe every day and every night. I was duly elected by the People of this wonderful county to serve as your Sheriff and I intend to do just that! Once again, thank you all for your continued trust in me and my department! Please use the following link to view video of the press conference on the Livingston County Sheriff’s Facebook page. Please join the L.C.S.P. 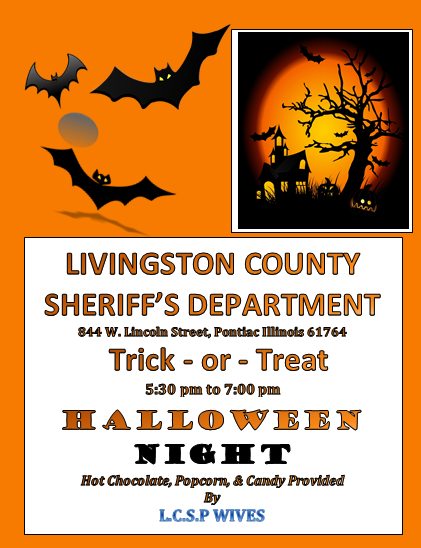 Wives for Trick or Treating at the Livingston County Sheriff’s Department on Halloween! Livingston County Sheriff Tony Childress advised that on 09/03/15, at approximately 10:30 am, a search warrant was executed at 516 E. Seminole St, Dwight, which led to the arrest of Anthony Barrera, Starr Martinez, and a male juvenile. During the investigation, 3.1 grams of controlled substances and a weapon was recovered. Barrera, Martinez, and the juvenile were arrested for Delivery of Controlled Substance. Barrera was also charged with Unlawful use of a Weapon. Agencies involved with the arrest were the Livingston County Patrol Units, Livingston County Pro-Active Unit, Dwight Patrol, and Dwight K-9 Unit. The investigation continues. Detectives to arrest subjects involved in a multi-county residential burglary ring. appearance in front of a Will County Judge. ongoing with additional charges and arrests pending. activity when you see it. those events is encouraged to contact the Sheriffs Police. Livingston County Sheriff’s Police have responded to multiple residential burglaries in the past twenty-four hours. The residences were all unoccupied and in rural areas. The burglaries appear to have occurred during the daytime, or early evening hours, are still under investigation, and may or may not be related. A blue passenger car, possibly a Mercury, with multiple occupants was seen in the area and may have been involved. An image of the vehicle will be posted to the Livingston County Sheriff Facebook page. There may be additional suspect vehicles as well. Anyone with information about this vehicle, or other suspicious vehicles seen yesterday afternoon or evening are asked to contact the Sheriff’s Office. Livingston County Sheriff’s Police are also investigation multiple burglaries to motor vehicles that have occurred over the weekend. The unlocked vehicles appear to have been entered during the overnight hours. If anyone sees suspicious persons or vehicles, please contact 9-1-1 when it occurs. Deputies are available at all hours, day or night. The Sheriff’s Office would rather investigate a suspicious person, than a break-in to your residence. 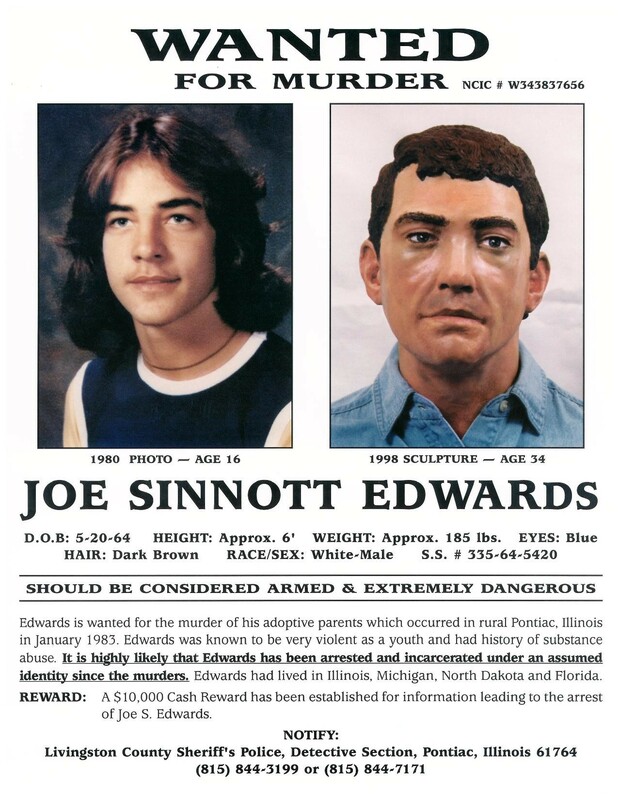 YOUR information may be what leads to solving these crimes. Anyone, with information regarding the break-ins, or any other crimes, is asked to contact the Sheriff’s Office at (815)844-0911, by email through the Sheriff’s Office Webpage, livingstoncountysheriff.com, or on Facebook at Livingston County Sheriff. Again, YOUR information may be what leads to solving these crimes. We will continue to provide updated information as it becomes available. On 8/9/15, at approximately 4:00pm the Livingston County Sheriff’s Police responded to a domestic situation in rural Long Point that resulted in the shooting death of one male subject. One male suspect was taken into custody and the incident is being investigated by the Illinois State Police. We believe this to be an isolated incident and no further suspects are being sought in this case. Other agencies assisting with the incident were the Illinois State Police and the tactical response teams from the Pontiac Police department, Streator Police Department and the LaSalle County Sheriff’s Office as well as the Bloomington Police Department’s Hostage negotiation team.